Have you 8 minutes? Please watch this video sharing about three people connected to BACN, and its impact on their lives. This video was created through the generosity of Rotary Charities of Traverse City, by PB & J Marketing who also donated many hours of their expertise to the project. As the temperature drops, we begin focusing more on keeping Neighbors warm. 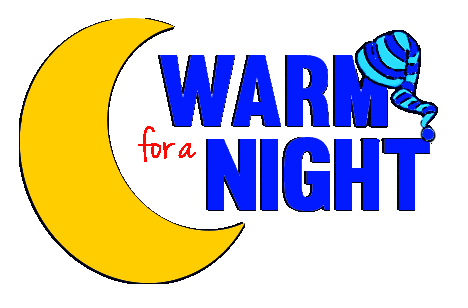 In January 2018, we’ll begin sharing the Warm for a Night program with area hoteliers, the local news media and our Facebook page. Watch for these updates! 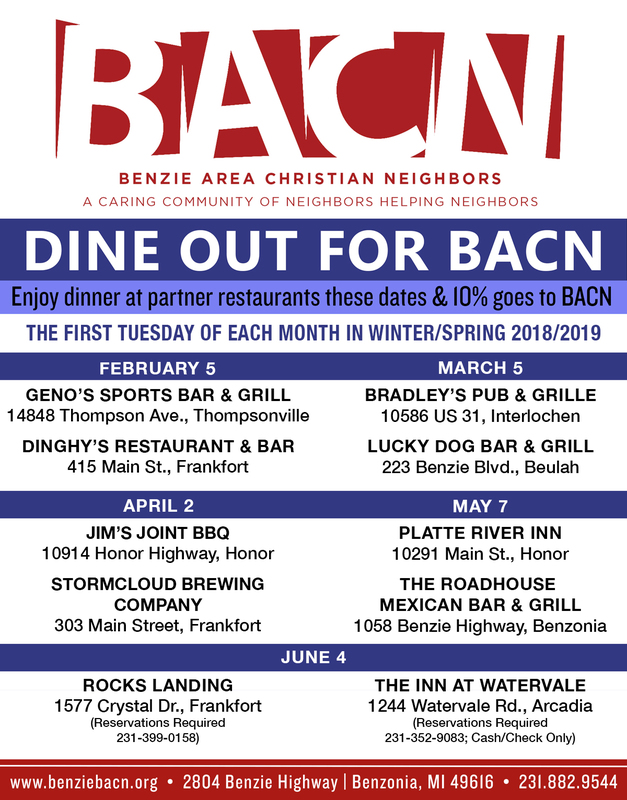 For more information, or to participate, contact Kelly at BACN—231-882-9544, ext. 227, or kottinger@benziebacn.org. Is the clothing appropriate for the current season? Please be patient with us as we narrow our focus. BACN’s hallmark of service is dignity and respect, and for now, we only have the ability to accept clothing that our Neighbors will be able to wear with the same sense of pride as we do our own clothing, and basic kitchen needs. Thank you for your understanding! If you're not a Facebook member, view our page here. If you are a member, LIKE our page! 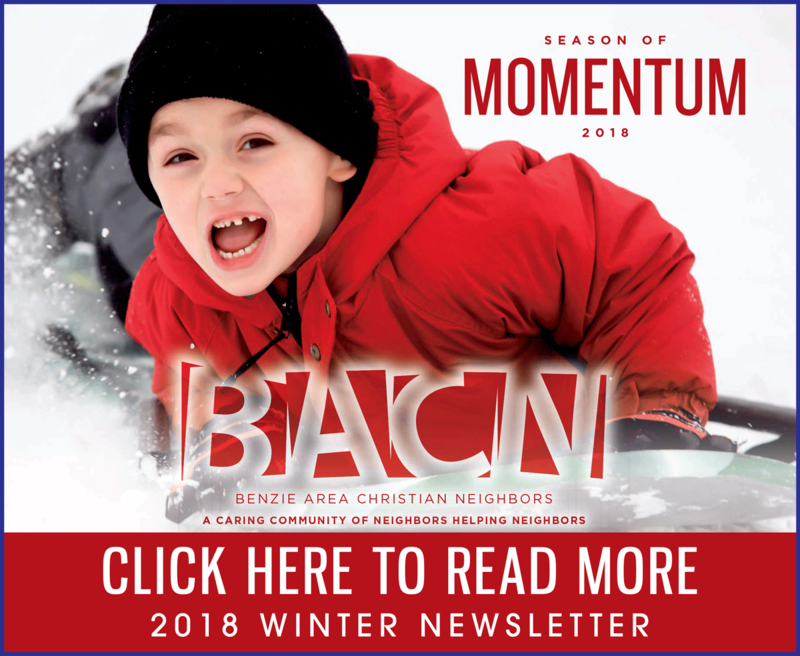 Benzie Area Christian Neighbors strives to improve the quality of life for people with limited resources in our community by providing food, clothing, financial assistance, education and social support in collaboration with area resources. If there either Benzie Central Schools or Frankfort Elberta Area Schools are closed because of weather, BACN is closed for the day. We will be CLOSED Wednesday, November 21 through Friday, November 23, 2018. We'll reopen on Monday, November 26, 2018! We'll also be CLOSED Monday, December 24, 2018 through January 1, 2019. We'll reopen on Wednesday, January 2, 2019! Does your local business have employment needs? Contact us through this website and we’ll promote the open position to our Neighbors directly, and on our Facebook page!